ADVANCE TICKETS ARE SOLD OUT! There will be a limited number of tickets available at the door, cash/checks only. Gamelan Pacifica presents an evening with Darsono, one of the most prominent musicians in Central Java today. Darsono will be making his first appearance in Seattle. Also joining Gamelan Pacifica will be guest pesindhen Jessika Kenney. The concert will feature Gendhing Candranata, Ketawang Gendhing Kabor, Jineman Kandheg and other pieces from the Central Javanese repertoire. Darsono comes from a prominent family of music and theater traditions in Central Java, Indonesia. He grew up in a small village outside of the court city of Surakarta, long known as one of the major hubs for performing arts in Indonesia. Darsono studied karawitan, a genre of music played with a gamelan (a primarily bronze percussion ensemble) from Central Java. 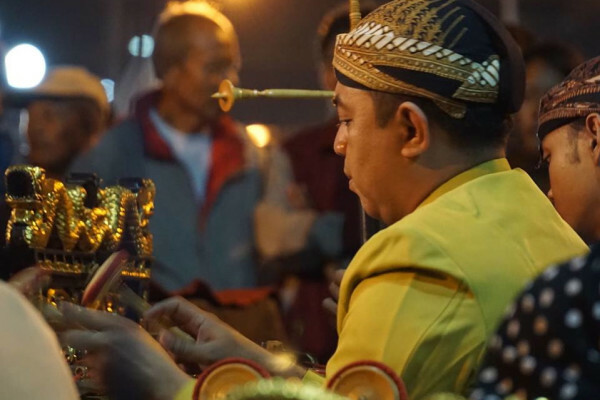 He also learned the revered art of shadow puppetry, primarily from his father and other relatives, until he continued his study of Indonesian performing arts at Institute Seni Indonesia, a national conservatory of the arts in Indonesia. Darsono graduated in 2002 with a Bachelor of Performing Arts, and a major in traditional Javanese court music. Today, he is one of the most prominent musicians inside and outside of the city of Surakarta. At the royal court of Mangkunegaran, Surakarta, he serves as the main drummer for dances performed at the court. In the surrounding villages, he is regularly featured as an accompanying musician at shadow puppet theater performances (wayang kulit). At his alma mater, he teaches and inspires many young generations of musicians who are mesmerized by his improvisational practices on several instruments of the gamelan. Darsono’s first opportunity to perform abroad was when he joined the original troop for Robert Wilson’s I La Galigo, a musical theatre production based on a myth from Sulawesi, Indonesia, which premiered in Singapore in 2004. Ever since, he has traveled widely as a teacher and performer of music as well as a puppet master (dhalang) in Europe, the US, and Asia. In the U.S., Darsono has been appointed as an artist-in-residence at several institutions, including Wesleyan University, Smith College, Tufts University and Bates College. He is currently a Visiting Scholar at Cornell University. During his residencies in the U.S, he has traveled and performed music with a number of university and community groups. Darsono is proud to watch the traditional arts of his culture — the trade of his family for generations — become a bridge that allows him to travel far, experience various cultures and interact with people from all over the world. Darsono believes that within the domain of the performing arts, there is a “mysterious property” that allows people from various backgrounds to naturally come together, transcend differences, and reach a deeper mutual understanding. Gamelan Pacifica is among the finest ensembles devoted to the performance of music for gamelan in the U.S. Formed in 1980, it has performed extensively in the Pacific Northwest, as well as Canada and throughout the U.S. Gamelan Pacifica is an active and adventurous ensemble, with a reputation for creating diverse productions merging traditional and contemporary musical forms with dance, theater, puppetry, and visual media. They perform often in the Northwest and have been guest performers at The Smithsonian Institute’s Festival of Indonesia, New Music Across America Festival, Vancouver New Music Society, On the Boards, Walker Art Center, Performing Arts Chicago, and many others. Visiting artists have included some of the most notable artists of Indonesia, including Rahayu Supanggah, Al Suwardi, Peni Chandra Rini, Heri Purwanto, Sutrisno Hartana, Wayan Sinti, Didik Nini Thowok, Sri Djoko Rahardja, I Made Sidia, Endo Suanda, Dedek Wahyudi, Ki Purbo Asmoro, Goenawan Mohamad, and Tony Prabowo. Gamelan performers: Noah Colbeck, Michael Dorrity, Stephen Fandrich, Ted Gill, Emily Hockel, Austin Larkin, Will Lone, Deena Manis, Richard Robinson, Sean Ryan, Troy Scheifelbein, Stephanie Shadbolt, Jesse Snyder, Jarrad Powell (Director).